Originally uploaded by Mal Cubed. 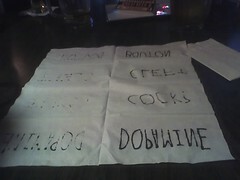 I got bored near the end at the bar last night. It says "DOPAMINE" on it. Not to mention "BOUTON" and "CLEFT". These are all subjects of great relevance to this blog, believe it or not.